Birds have wings and feathers, and they can fly. The ability to fly is fundamental and the whole bird skeleton is modified for this mode of locomotion. Flight has also modified the soft anatomy of birds, with flight muscles occupying much of the trunk, and a highly efficient metabolism and respiratory system designed to cope with the demands of fast or long-term flapping of the wings. ment of flight muscles, and at least one pneumatic foramen leading to an air space inside the bone. 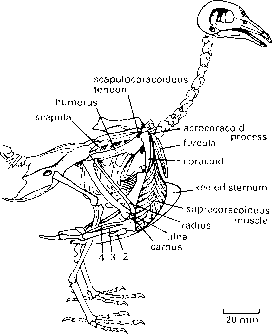 The most dramatic modifications of the modern bird skeleton are seen in the shoulder girdle and sternum. In flying birds, there is a deep sternal keel that provides extensive areas of origin for the pectoralis muscle (downstroke) and the supracoracoideus muscle (upstroke and flight control), and these insert on the lower and upper faces of the humerus respectively. The supracoracoideus runs over the acrocoracoid process on the coracoid and through the triosseal foramen between the coracoid, scapula and humerus, a pulleylike arrangement seen also in pterosaurs (see p. 227). 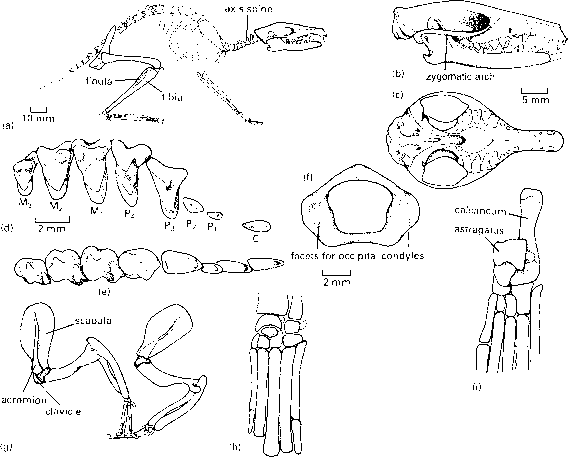 The sternum is a key element in the flight apparatus of modern birds, and it is stabilized by a long strut-like coracoid, very different from the small squarish element in Archaeopteryx (Figure 9.2(a)).